WASHINGTON — Despite widespread calls to fix crumbling highways, bridges and rail systems, a House bill introduced Friday maintains spending at current levels — suggesting Congress is unlikely to soon tackle a growing transportation maintenance and modernization backlog. The bipartisan, six-year bill provides about $325 billion over the next six years, continuing the current spending rate while allowing for inflation, congressional officials said. The Senate passed a similar bill in July that would allow $350 billion over six years, but provide funding for only the first three years. Industry lobbyists are already at work trying to roll back key spending provisions in the Senate version they argue are unfair or unwise. Transportation Secretary Anthony Foxx said last month that $400 billion over the next six years is “the absolute minimum level of investment” needed to keep traffic from worsening. The House bill contains a provision that would allow transportation spending to grow if Congress can find the money, but that prospect is dim. Lawmakers are struggling to identify enough tax changes, spending cuts and other revenue sources to keep spending at its current rate, let alone increase it. Sen. Charles Schumer, D-N.Y., a top party leader, and Rep. Paul Ryan, R-Wisc., chairman of the House Ways and Means Committee, have been unable to reach agreement on a way to make U.S. corporations pay taxes on profits parked overseas, money that could be used for transportation. To just keep spending at current levels, lawmakers must scrape together about $16 billion extra each year to make up the shortfall between gas tax and other user fee revenue that comes into the federal Highway Trust Fund — about $34 billion a year — and the amount the fund doles out to states for highway and transit programs, about $50 billion a year. The House bill was introduced by Reps. Bill Shuster, R-Pa., chairman of the House transportation committee, and Peter DeFazio of Oregon, the panel’s top Democrat. 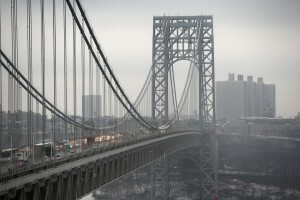 Left: A new bill in the House would not raise money available to rehabilitate or maintain highways, rail systems, or bridges, such as the George Washington Bridge pictured above.